Description: Wingspan 62-80mm. Adults have generally pale grey wings with a yellowish-brown thorax. The abdomen is grey and quite hairy, marked with a series of black bands. The forewings are pale grey with yellowish veining and a series of black dots along the outer margin. The hindwing is almost white with yellowish veining. Status: Widely distributed in southern counties, sporadic in the north, although it has been recorded on Rathlin Island. Many of the records refer to the bright green larvae, which are easier to find than the secretive adults. Its strongholds seem to be the bogs and fens of north Armagh and similar sites in Fermanagh. 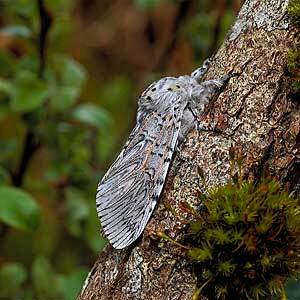 Ecology: This large, hairy moth is found on bogs, marshes and the damper parts of woodland where willows thrive. Adults come sparingly to light and seldom appear in more that ones and twos. The impressive and distinctive bright green larvae can occasionally be found on the lower branches of the foodplant between July and September. They have been recorded on willows Salix spp. in N. Ireland. Overwinters as a pupa inside a tough cocoon attached usually to the trunk or branch of a tree. World Distribution: Throughout Europe eastwards to Japan.